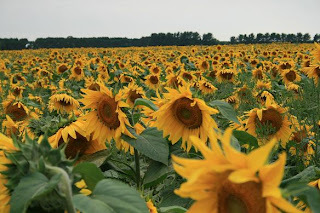 Everyday as I drive to work I am blessed with the view of this beautiful field of sunflowers, I just felt I had to stop and take some pictures yesterday and show all of you. If you live in the area and want to see this breath-taking sight for yourself, it is located right on Highway 37, not too far from Eau Claire. Here is a close up of one of the flowers. Doesn't the detail of SINGLE flower simply amaze you? Here is a semi-close up shot of the sunflower field. And here is a far away shot so you can get somewhat of an idea of the size of this field. And actually, this picture doesn't even do it justice. 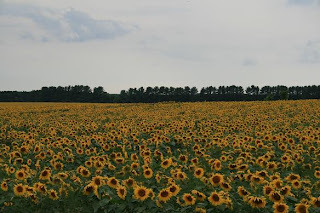 This sunflower field goes so much farther South and North, I couldn't even capture it on film. Wow!! What awesome Sunflowers!!! You can't get any more beautiful than God's Creation!! TFS! Have a great weekend!! Those sunflowers are awesome!! TFS! Simply beautiful- thanks for sharing this! We have an awesome Creator don't we?? Lord have mercy ... this is absolutely breath taking!! Thanks so much for taking the time to photogragh it to share with us! WOW!!! OH my these are gorgeous photos...wow lucky you to drive by these everyday!! 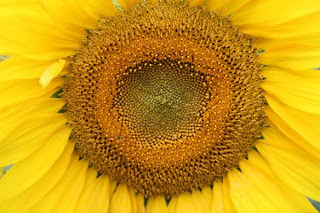 Those details of the sunflower are amazing, you are so right another example of god's beautiful creations!!! Thanks for sharing these pics, I really enjoyed them! Have a great weekend Amy! What incredible photos. I don't think I've ever seen an entire field of sunflowers. It's fabulous.